Why Does Raw Zucchini Cause So Much Intestinal Gas? Zucchini belongs to the same family of vegetables as melons, cucumbers and pumpkins. You can eat cooked zucchini on its own or in dishes such as breads, pastas and casseroles. You can also eat zucchini raw; according to the University of Arizona Cooperative Extension, the vegetable is best when fresh. Zucchini is a rich source of folic acid, beta carotene and vitamins E and C, as well as several minerals, including potassium, calcium and iron. Raw zucchini can also cause gas and bloating. To understand why raw zucchini causes so much intestinal gas, you need to know about cellulose and how the digestive system works. The fruit, leaves and stems of the zucchini plant all contain cellulose. All plants have cellulose, which makes up the walls of the cells and is composed of multiple carbohydrate chains, called polysaccharides. Polysaccharides are sugars with multiple, complex bonds. Cellulose contributes to the strength of the cell walls and helps the plant maintain its shape. Cellulose also adds strength and flexibility to paper products and cloth such as cotton, linen and rayon. In addition, cellulose is the primary component of dietary fiber. When you eat, your body releases several enzymes to break your food down into its component parts. When the food reaches your intestines, you release an enzyme called amylase to break down the carbohydrates in plants. Amylase breaks down simple carbohydrates, called monosaccharides – sugars with very simple bonds -- but it can't break down the polysaccharides in cellulose. None of the other digestive enzymes can break down cellulose, so it stays in your intestinal tract. In addition to digestive enzymes, the intestinal tract also has bacteria that contribute to the digestive process. The bacteria feed on the cellulose in the intestines, which helps break it down. As the bacteria feed on the cellulose, they release waste in the form of methane gas. Plants such as zucchini provide plenty of food for the bacteria, so the bacteria releases a large amount of methane gas. 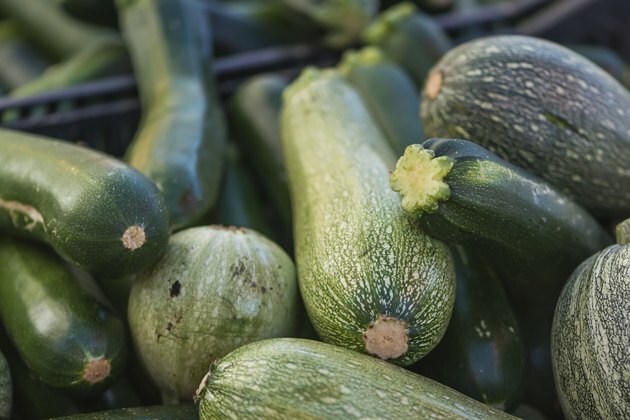 Heat weakens the complex cellulose bonds, so eating cooked zucchini produces less gas than eating it raw. You can also find over-the-counter products that you can add to your food to reduce the amount of gas your body produces. You can also take an anti-gas product after you eat to break up the gas caused by raw zucchini.